Check out this selection of Wall Stickers, any of which would make a lovely addition to a themed bedroom. Some of them are only available in either the US or UK, with some being able to be shipped worldwide. 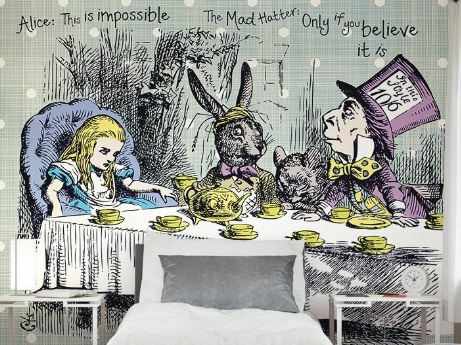 Don’t miss out reading my dedicated Alice In Wonderland Bedroom Ideas post. A gorgeous silhouette Wall Sticker, consisting of Alice and the White Rabbit. 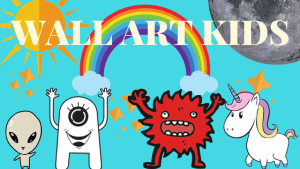 Handmade item & Ships wordwide from the US. The seller says that this decal should last for 6 years, if properly applied. 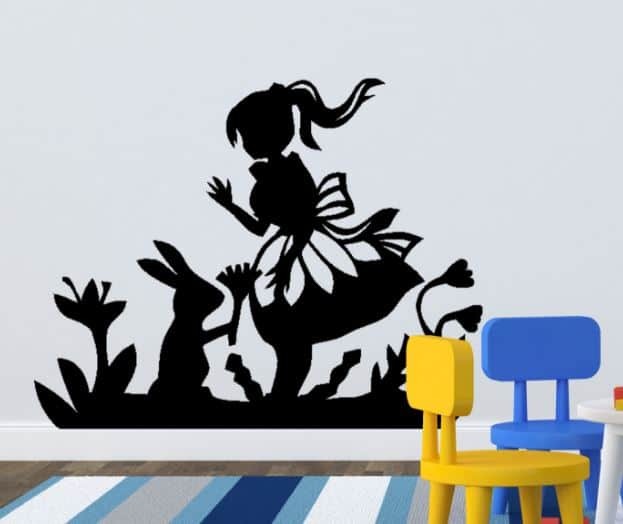 Check out the Alice silhouette Wall Sticker here. Rather than a full picture, what about a quote from Alice In Wonderland? While this one is demonstrated in a living room, it could certainly look great in a child’s bedroom. 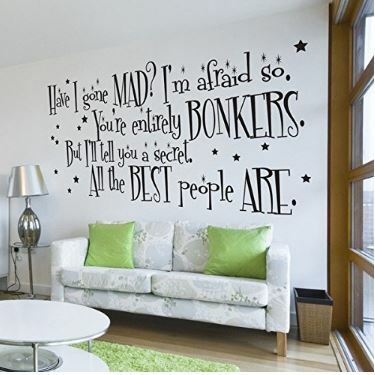 Perhaps in addition to some traditional Alice Wall Stickers too. Check it out here. 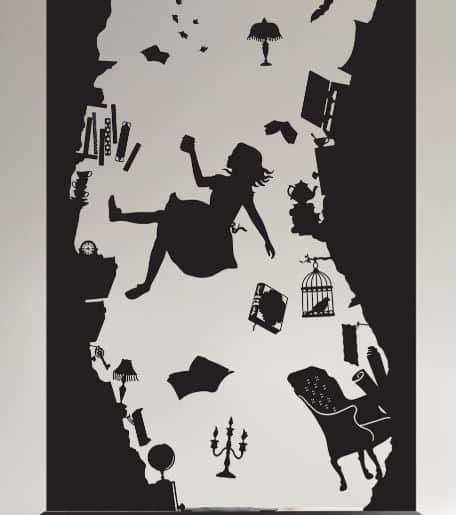 I absolutely adore this one, a wonderfully detailed silhouette style Wall Sticker, showing Alice falling down the rabbit hole and all the interesting items falling around her. Again, this is a handmade item and is available for shipping worldwide. If the size isn’t ideal for you, you can check with the seller for it to be adjusted. 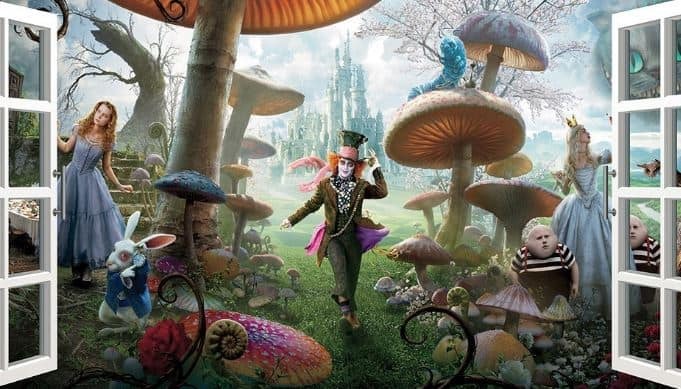 Check details for Alice Rabbit Hole Wall Sticker Here. Another Alice In Wonderland quote, this time from the Cheshire cat. This item is made to order and can be shipped wordwide, you can also choose from a variety of colours. 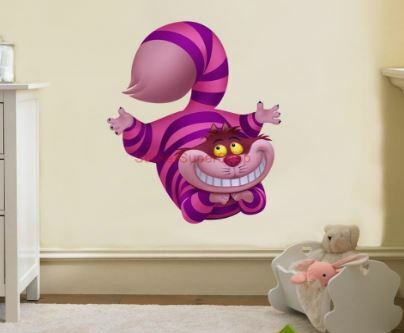 Check out Cheshire Cat Wall Sticker Here. 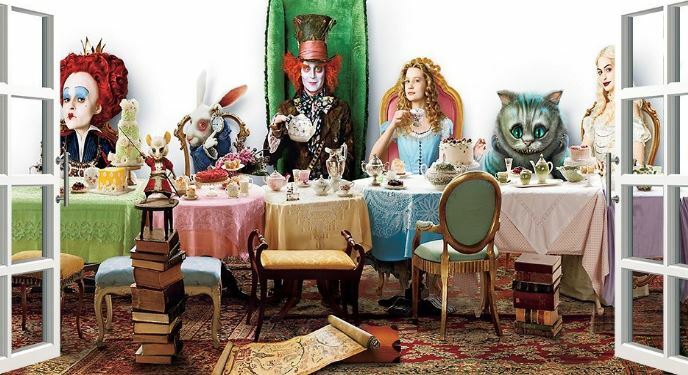 If you’re a fan of the more recent Alice In Wonderland films, you’ll love this. 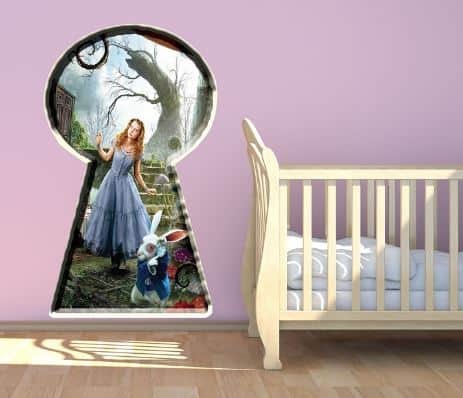 With this realistic style Wall Sticker, it looks as though Alice is about to walk into the room via a keyhole! There are three sizes available – see here for further details & prices. The only non-wall sticker in this section – this is in fact a mural, that you’d need to apply like wall paper. with more of a traditional style, this would look wonderful covering a nursery wall. Check out the Alice In Wonderland Mural. Another good choice for fans of the modern Alice films. This one has a realistic effect, appearing like an open window on the wall. Large mural size, this will create a big impact. See here for more details. Large Alice vinyl decal, a simple and classic design – in the style of the Disney film Alice. Great for creating a subtle effect without dominating the room. 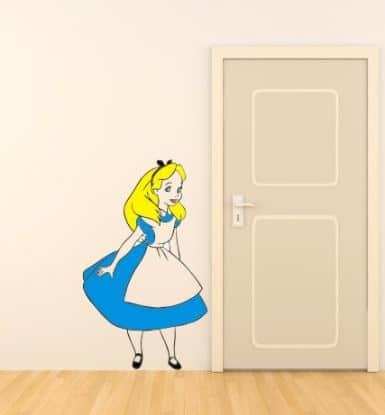 See full details for this Alice Wall Sticker. 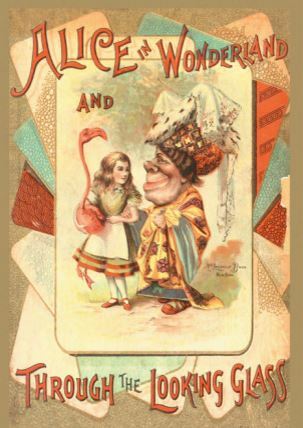 An original and unique Alice through the looking glass wall sticker. Quite a departure from the regular designs, with a quirky feel. Quick and easy to apply, this would make an unusual addition to your themed room. Through The Looking Glass Wall Sticker Here. Large poster style wall sticker, that you can just peel and stick to apply. 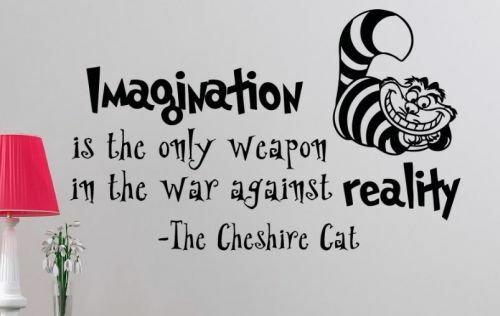 A fun and colourful Cheshire cat Wall Sticker, this one is also very easy to apply. Simply peel & stick! He also comes in three different sizes. There is also a White Rabbit version available. Check Out The Cheshire Cat Here!